The next time someone tells you to show ’em the money, turn them on to Tine De Ruysser’s artfully folded origami necklaces and bracelets—made from actual banknotes. Pillaging currency from every continent, the Belgian artist flexes the colorful bills into chain links, weaves them gum-wrapper-style, or pleats and shirrs them into shape. A stack of 46 Bhutan ngultrum, for instance, is creased into demure floral forms, while 18 Argentinean pesos are looped into a crisp bracelet. Want to make a statement about being crushed between the cogs of the capitalist machine? 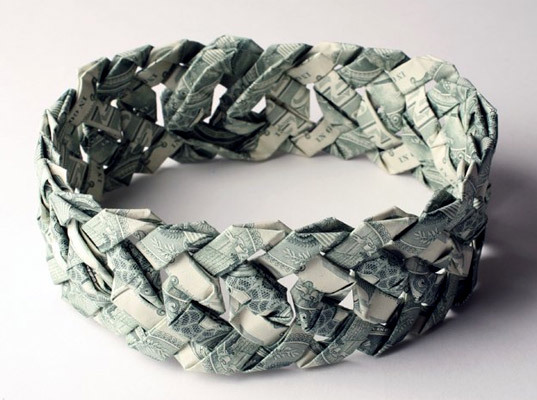 A choker made from 24 interlaced U.S. dollar notes is a penny-wise (or is that pound-foolish?) investment. 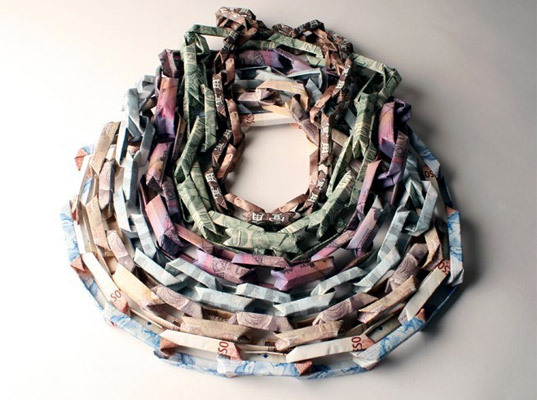 The next time someone tells you to show 'em the money, turn them on to Tine De Ruysser's artfully folded origami necklaces and bracelets�made from actual banknotes. Pillaging currency from every continent, the Belgian artist flexes the colorful bills into chain links, weaves them gum-wrapper-style, or pleats and shirrs them into shape.